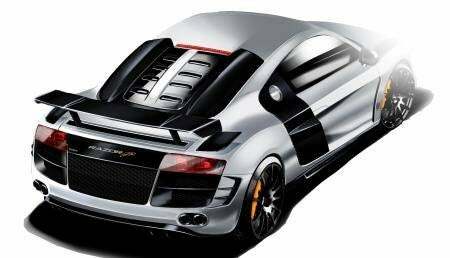 PPI, the crazy German Audi tuners have turned an Audi R8 supercar into madness. They’ve already heavily tuned an R8 into what they call the PPI R8 Razor – introduced at the Essen Motor Show, but have since went off the deep end, creating the Razor GTR. The PPI Razor GTR isn’t just about the radical styling and aerodynamic improvements (which are significant, as you can see,) but they’ve increased the engine output to 580 horsepower with the help of a supercharger system, ram air intake, and a stainless steel exhaust system. In addition to a new widebody skin, PPI redesigned the R8’s sideblades, rear bumper, and rear fenders for better airflow, designed a new front bumper and rear spoiler for more downforce, and redesigned the hood and sideskirts for better brake cooling and to route air around the sides for better airflow. Those huge air inlets you see in the rear feed air into the engine, further increasing power as well as help with cooling. All of these parts are made of carbon fiber, of course, which reduces the total weight of the R8 by a significant 551 lbs. The wider body isn’t just for looks – PPI had to increase the already wide stance of the R8 to accommodate the wider, specially designed wheels which increase grip and stability. A newly designed braking system has also been added, which includes bright orange 6-piston calipers and huge rotors. A new coil-over suspension kit has also been added, allowing for a hydraulic lift system which gives the car a couple more inches of ground clearance (Lambo-style) for those pesky speed bumps and steep driveways. Nope, we’re not done yet. PPI has also changed the R8 interior into what they call a “members-only lounge” by replacing the stock leather with Onyx Nubuck-leather with orange-colored accents and highlights. They’ve also added a ridiculous amount of carbon fiber trim to the interior, replaced the steering wheel and seats with their own, and added some badging to remind you of this car’s exclusivity. No pricing has been announced, but given the limited production numbers and extensive modifications, expect it to be very…very expensive. The car will officially debut at the 2008 Essen Motor Show in Germany tomorrow. 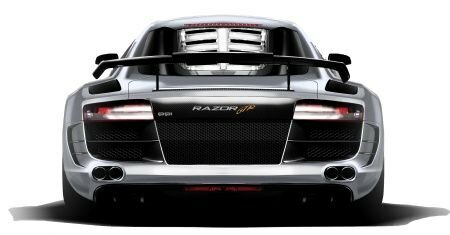 5 Comments on "PPI Razor GTR – A Faster Audi R8"
That PPI Razor GT3 is one very nicely modified R8. 551 pounds lighter is FANTASTIC. Agreed Vinay, a 551 lb weight reduction is incredible, and will add a significant amount of performance to an already great-performing car. I just heard back from Ronald from PPI, and he said they're only doing a total of eight of the Razor GTRs, and the first customer will take delivery on the 2nd of February.